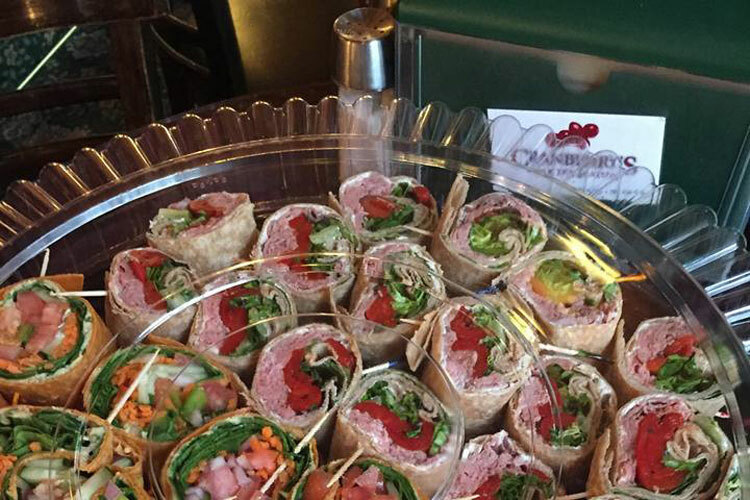 We specialize in box lunches and all kinds of platters: wraps platters, sandwich platters, veggie platters, fruit platters – even breakfast platters! You can pick up your catered order, or we can deliver it to most places in the Staunton area and set it up where you would like. You can also reserve our upstairs meeting room for your function and have us cater your group right here on our premises. Our room seats 36 people at tables with chairs. Please give us at least 48 hours notice on catering orders. A container of 12 cups of our signature Staunton Coffee; organic, fair-trade, locally roasted coffee. With cream, sugar and stir sticks. A wrap or sandwich of your choice, bag of Route 11 chips, and an apple in a convenient to-go box with handle. Add a large cookie, small chocolate bar, or a bottled drink for an additional charge. A platter of delicious in-season fresh fruit with a yogurt dip. Perfect for a party, delightful for breakfast, or an upscale touch for lunch. A selection of colorful fresh veggies with Caesar dip. Super for lunch, great for a party. An array of our delicious Cranberry’s sandwiches. Choose from turkey, ham, roast beef, and/or BLT on Newtown multigrain bread. Ask about gluten-free options. 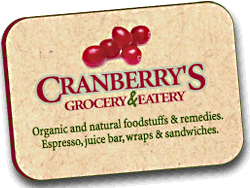 It’s hard to beat the variety and taste of our Cranberry’s mini-wraps. Our most popular selections include the Garden Wrap with hummus, the Rockin’ Roast Beef wrap, and the Taj Mahal with tofu or chicken. Ask about gluten-free options.